When starting out programming there are so many things that you need to learn. The problem is made worse by the fact there are so many things you do not know you need to know. Added to this is a multitude of things that you think you need to know that you try to learn. 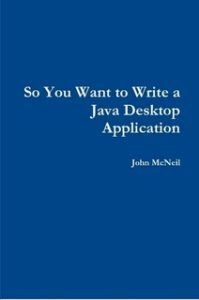 So You Want to Write a Java Desktop Application was written for just such a situation. This book takes you step by step through the process of building a Java application with JavaFX. The aim of the book is to build an application starting with a basic description, understanding the application design, and working through each section fully. All the code is provided so the reader can build as they read. By the end of the book, you will have a working application, as well as a good understanding of how to design and build your own applications.